In perhaps the most obvious understatement you'll read online today, Social Security is a complex, and sometimes complicated, topic. 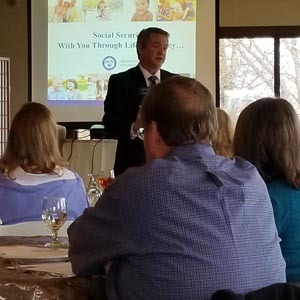 The Boone Area Chamber of Commerce is partnering with Edward Jones Investments - Jason Sirmon and the Social Security Administration (SSA) to provide answers to your questions about Social Security during two sessions scheduled for Tuesday, October 30th. Registrants can hear updates on benefit claims procedures, important filing timelines, and other helpful information direct from Lisa Wallace, Public Affairs Specialist for the SSA. She will also answer additional questions from the audience during each session. The programs will be held in the Watauga Medical Center Auditorium. A lunchtime session will be held from Noon to 1pm while a dinner session will follow from 5:30 to 7:00pm. Both sessions will include the same information, so pick the time that works best for your attendance. To register for the lunch session, please click here. To register for the dinner session, please click here.